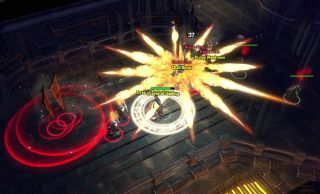 Last week, we got a first look at the single-player action in Sword Coast Legends, the upcoming isometric RPG being developed by veterans of the Dragon Age: Origins team. Now the studio has released a new "dungeon crawl" video demonstrating how Dungeon Masters will interact with adventuring parties in the multiplayer portion of the game. Dungeon Masters can create a basic dungeon layout, then adjust it on the fly as players work through it. It's possible to slow them down by throwing up locked doors, or hasten the action by spawning random monsters, all in real time but also limited by 'threat,' a DM-specific resource that must be spent in order to change the environment and its denizens. Dungeon Masters can also collect loot over the course of a crawl that will grant them specific abilities—in this case, to unleash a horde of inconveniently-timed zombies. The comparisons so far have been with Infinity Engine games—Baldur's Gate, Icewind Dale, and Planescape: Torment—but this aspect of Sword Coast Legends is very reminiscent, at least to my eyes, of Neverwinter Nights, which also allowed players to run games as DMs. We'll see how that holds up as more information becomes available: Design Director Tim Schwalk says that the studio has "a lot more to show in the coming months," including a more in-depth look at campaign creation. Sword Coast Legends is slated to come out later this year.